Every day thousands of students walk along the engineering quad, crossing the bridge over Boneyard Creek. While many students don’t even notice the creek, it is home to a surprising diversity of fish species. Boneyard Creek is a headwater creek which feeds into many drainages, ultimately leading to the Mississippi River. This ecological connectivity provides continuous habitat for fish migration including several species of sunfish, largemouth bass, and catfish. On any given day, you may find as many as 20 (or more!) different species of fish. 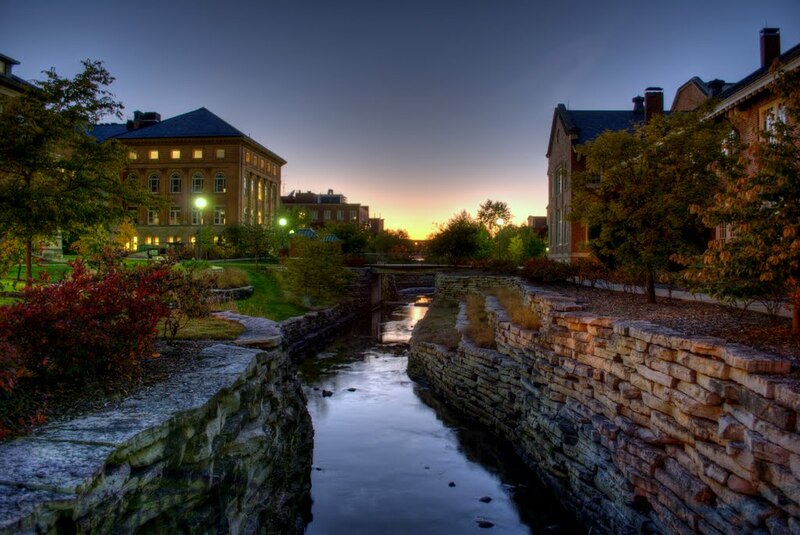 Despite being the main aquatic feature, it remains an overlooked part of campus. The website fishesofboneyardcreek.weebly.com was created to educate unwitting residents and incoming students at the University of Illinois at Urbana- Champaign about the surprising abundance of fish in Boneyard Creek. This website was made by the Ichthyology Classes of 2012, 2014, and 2016. It provides an array of information, including the history of the creek, a list of present fishes, a dichotomous key to identify them, education activities for children, and a volunteering tab that tells how you can contribute to the health of the Boneyard Creek. Many resources are included on this website, and it effectively serves as the information hub for all things Boneyard Creek. Click here to see an underwater video of fish in the creek recorded by Elise Snyder. The Fishes of Boneyard Creek website is the result of a unique class project that stretched across three different cohorts of Ichthyology students (IB 463 from years 2012, 2014, and 2016). The 2012 course originally made the site. The 2014 course greatly improved it. The 2016 course created videos that explained how to use a dichotomous key. The 2012 class obtained a list of ‘potential’ fish species that could be found in the creek based on historical records from the Saline Branch, into which the Boneyard Creek feeds. The class has continued to sample the creek and to perform numerous class projects. One project has addressed the question of whether fish use the fish ladder at Scott Park. Another project sampled fish with minnow traps. Another project performed seine hauls to assess the fish community. 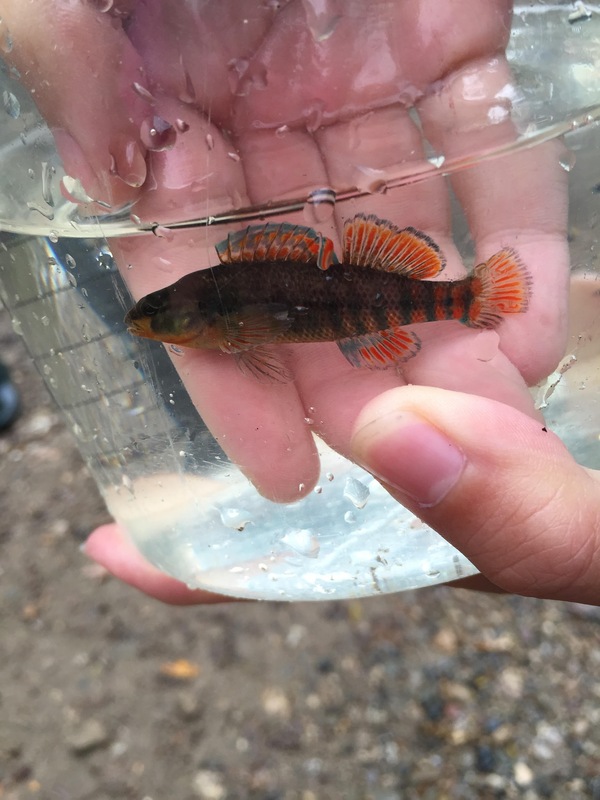 Creating this website and the accompanying videos not only taught us about the specific characteristics of the Boneyard Creek fish species – it also taught us how to communicate science to the public. We learned not only how to identify the different species of the Boneyard, but we also learned valuable skills like script writing, video editing, and how to present scientific information in a digestible way. These skills are vital in the modern scientific world where there is a heavy emphasis on communication and presentation of findings. Having scientists who are able to communicate with the public ensures that information can be utilized in a meaningful way. We hope that this project continues to go forward and ask/answer meaningful questions about the Boneyard Creek. Check out new research from our own IB Prof Evan DeLucia! Second-generation biofuel crops like the perennial grasses Miscanthus and switchgrass can efficiently meet emission reduction goals without significantly displacing cropland used for food production, according to a new study. The researchers call it the most comprehensive study on the subject to date. This week’s post is from 2013 IB graduate Andrea Chez, who just completed her first year of medical school… in Australia! Shock was usually the first reaction that I got when I told people that I was moving to Sydney. And the question that I always got, and am still getting asked, is “why Australia?” Up until my senior year, I had never considered medical school anywhere outside of the States. I had decided to study abroad for a couple weeks in January of 2015 (through the University). The focus of the trip was to learn more about global healthcare, and the diversity of different healthcare regiments, as well as population diversity. In the course of the fortnight that I spent in Australia, I had fallen in love. The idea that I could potentially contribute to helping Indigenous peoples, both medically and culturally, was exciting and invigorating. I also truly appreciated how largely mental health is emphasized. The view isn’t too shabby either. 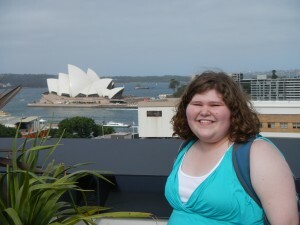 I had always known that I would like to study abroad throughout the course of my medical degree. I thought that I would arrange electives here or there in different countries, or utilize my summers to travel and explore. When I returned home, I decided to try and send off applications to some medical programs around Australia, without huge expectations that I would be accepted. That changed when I was notified that I had qualified for multiple mini interviews at both the University of Sydney and the University of Melbourne. The application process is not too different from the program in the States, but everything is much cheaper. One option is to apply to multiple schools through a main application that you send to the schools that you would like to apply to, but there is only one fee versus a fee for every school. Another way is to apply through an international representative (which I elected to do). My representative helped me throughout the whole process of dealing with student loans, applying for the correct visa, and just contacting the universities in general. The medical schools then conduct multiple mini interviews, in which a panel of interviewers will talk to different applicants and have them answer a variety of panel questions, each with a rubric of points that can be awarded. Once interviews are done, decisions are made, and places are awarded. Oddly enough, international tuition prices in Australia are pretty similar to domestic medical school tuition in the States. When I opened that acceptance e-mail, it was as if all of my hard work was validated. It definitely takes hefty doses of bravery and moxie to pack up your life, and start over. The decision to enroll in any schooling, let alone medical school, in another country, is one that doesn’t suit everyone. I love that I am completely immersed in a different culture, and will get to experience opportunities that I never dreamed of. However, there are days that I am quite homesick. There are also days that I couldn’t be happier. No matter what happens, I know that I have never regretted my decision, and am excited to see where this journey takes me. Hello again, my name is Sally Feng. I graduated with a B.S. 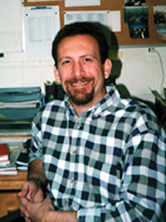 in Integrative Biology in May 2014. 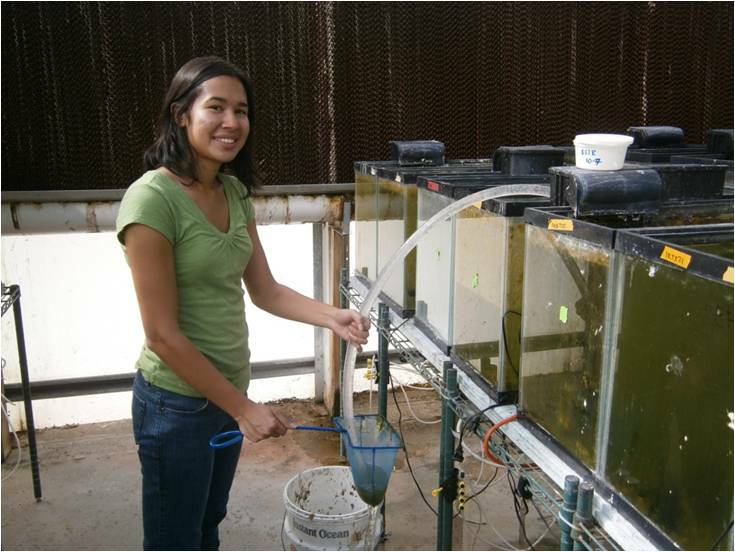 I am doing work on coral reef restoration in the Philippines under a Fulbright research grant. and abroad in South Africa (ANSC 398) and in Costa Rica (ANTH 445). I was also in Dr. Becky Fuller’s lab to see what it was like to work in another lab. The next thing you know, I was completing my own independent projects. I presented at the iBio Research Symposium and at the Undergraduate Research Symposium at U of I. I received funding from NSF REU, Office of Undergraduate Research and Bell lab to present at the Animal Behavior Conference at the University of Colorado Boulder and at Princeton University. After two semesters of IB 390, I enrolled in IB 490 to graduate with distinction. My senior thesis on color-reward association in stickleback fish has been accepted for publication in Animal Behaviour. I am part of the corals lab under Dr. Ronald Villanueva at the University of Philippines Bolinao Marine Laboratory. 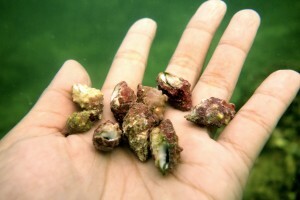 My study organism is Drupella cornus, a corallivorous marine gastropod. I am interested in seeing whether the gastropod chooses to feed upon a coral colony over another and whether the removal of the gastropod will have an effect in coral cover. Even though I had a project in mind, it requires a lot of patience to get an experiment started. This was my first field-based project. I had to figure out how to set up my study area underwater and what sites to use. I just became open water certified so I needed time to get comfortable in diving. I was set back a few weeks because of a storm and gale warnings. Soon it was Christmas and everyone was gone for the holidays. Finally, after two months since my arrival and with the help from the lab aids, I was able to set up my experiment. Since then my experiment has been running smoothly. 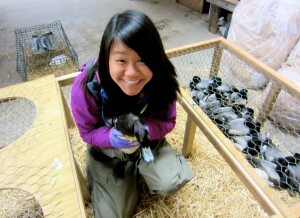 While research is my priority, I was able to pursue another interest of mine, environmental education. 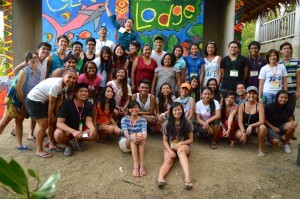 I attended SEA (Sea and Earth Advocates) Camp, a project of the Save Philippines Seas and U.S. Embassy Manila. 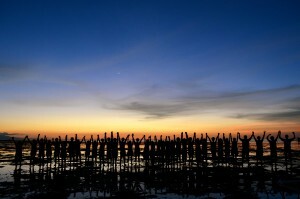 SEA Camp’s goal is to empower young seatizens as leaders in conservation. There were 30 participants, ages 18-23, from a diverse background ranging from university students to government workers. I was invited to give a talk on coral restoration and was a mentor to the participants with their project proposals on marine conservation. The camp was very well organized with resource speakers, workshops and other activities. 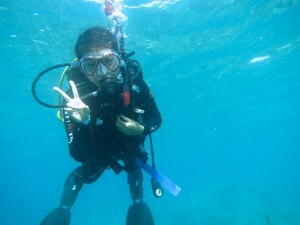 I enjoyed seeing how excited the participants became when they had the opportunity to snorkel and scuba dive. It was amazing to see how motivated everyone was in saving the Philippines Seas. I have been abroad for six months and only have three months left of my grant. I am extremely happy with my stay in the Philippines and am excited to see where I will be next. If you would like to contact me, feel free to send an email to feng.sally26@gmail.com. 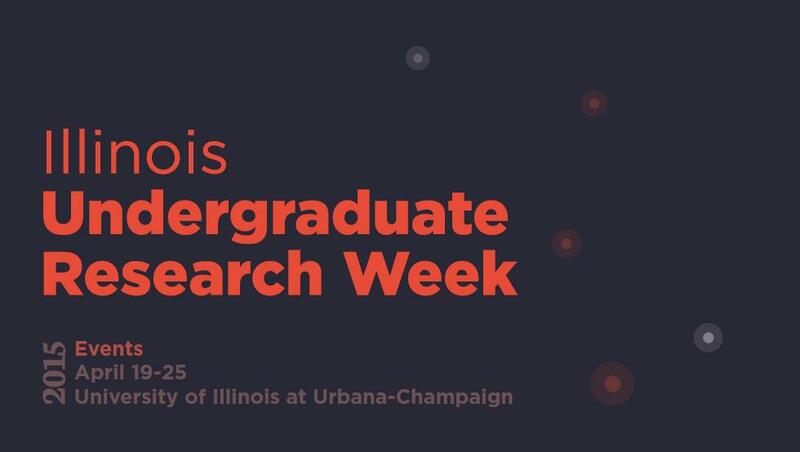 This week is Undergraduate Research Week, a celebration of student excellence in research across campus. The signature event is the eighth annual campus-wide Undergraduate Research Symposium (URS), held on Thursday, April 23rd. Elucidation of Dopamine’s Influence in Peripheral Sensing in Pleurobranchaea. Did you know you can “hack” photosynthesis? According to IB profs Stephen Long, Amy Marshall-Colon, and Donald Ort, using high-performance computing and genetic engineering to boost the photosynthetic efficiency of plants offers the best hope of increasing crop yields enough to feed a planet expected to have 9.5 billion people on it by 2050. In the late 1800s, with the University of Illinois facing growing enrollments and limited space, renowned University architect Nathan Ricker designed a distinctive teaching and research building at the heart of campus that he hoped would endure through the ages. He produced a gem—the Natural History Building. 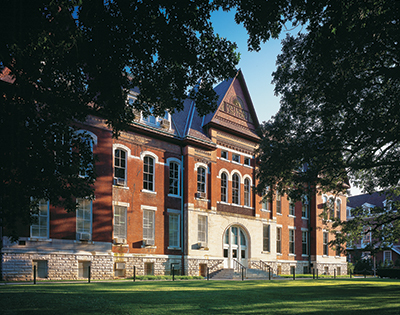 This historic structure has hosted generations of students studying geology, biology, and other disciplines. Distinguished scholars have taught, established laboratories, and conducted groundbreaking research within its walls. The renovation of the Natural History Building will create a dynamic education and research center. It will house classrooms, laboratories, and offices for current and future generations of geologists, geographers, and atmospheric scientists, and will be the center for biological and environmental education for students from across campus. IB students will gain skills to examine challenges such as the outbreak of a new infectious disease or the causes and consequences of declining biodiversity. They will combine an understanding of basic natural history with new technologies that will bring breakthroughs in fields such as genomics. The holistic approach of the School of Integrative Biology will prepare students to tackle complex problems ranging from understanding evolutionary processes to developing biofuels. For more on the NHB Renovation, including naming opportunities, and the story of a mysterious time capsule, please visit LAS News magazine. 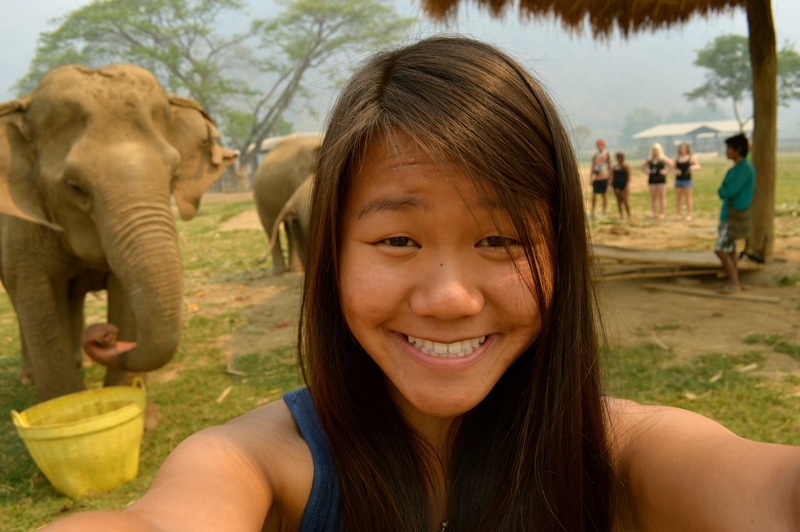 Amanda Ilag is a 2013 IB graduate and is our guest blogger this week! Remember how you felt studying for the MCAT, taking that organic chemistry final, or going to a volunteer service event all in one day? This is the kind of stress and stamina needed to get through medical school. Year one of medical school takes everything you need to know about the basic sciences and applies it to human anatomy and physiology all in one year. That’s why they tell you to be organized, efficient with your time, and good at assessing your weaknesses and strengths. Studying for medical school is a full time job. You need to find new test taking skills, reform your old ones or in some cases group yourself up with fellow peers so that you get the most out of the learning experience. In medical school you are working with an even more selective group of students so the pressure to do well is even higher. The way you need to study and take tests needs to be more efficient than it has ever been in your life. What I liked about SIU in Carbondale is that they counted our first exam lower than all other exams because they understood undergraduate to medical school could be a transition. It was also less pressure to compete for the best grades because our curriculum was a satisfactory/concern/unsatisfactory grading scale instead of actual grades. The good news is if you have the motivation and stamina to succeed; you will succeed! Get excited about testing yourself to the maximal potential of understanding! You’ll be pleased by how much you will have learned and even more curious about all there is to come. A big part of learning now in any medical school curriculum is through “problem based learning.” This style of learning was crucial in SIU’s curriculum. It was discussion based and really challenged students to help each other understand material in a non-confrontational (group of 6-8 students) and moderated setting (tutor group leader, either a doctorate faculty member in the basic sciences or an actual physician). It was so different than undergraduate lectures where the lecturer told you most things and there was little or no discussion between students before exams. With problem based learning, students were the ones discussing what could be wrong with a “fake patient” in the computer system whose “labs, physical exam, and history information” were based on a compilation of actual patient records. It is a chance to explain material in your own words, to see if you are on the right track, and helps solidify material into memory. I learned a lot about myself by talking with fellow students. Not all of your classmates are fresh out of college, in fact some may already be married with kids, so it was neat to gain new perspectives on life by talking with fellow classmates who are different from me. I made a lot of new friends that I hadn’t expected to make based on age, diverse background, previous work experiences, etc. We got to know our peers well because of our small class size, making it easy to be studious and to get together when we needed to have fun. There is some clinical experience involved in year one. First years got a mentor to shadow in a specialty of your choice (mine was family medicine) where I would go once a week to observe and learn how to talk to patients from the surrounding community. You learn techniques for doing physical exam, what type of questions to ask to lead you to a list of possible diagnoses, and you learn to communicate this information concisely both verbally and in writing. You still have time for hobbies, significant others, and relaxation you just have to be smart with your time; and be ready to adjust as necessary. And when you do find yourself in stressful situations get help from people you know and trust. There were many people on our faculty and fellow students that helped me deal with stress. And my family continued to be a strong means of support. If you are applying to medical school or thinking about applying consider this… IS the lifestyle of a medical student something you can work with? CAN you imagine doing anything else? If you answered YES, then NO, go for it. If you have applied but are not sure whether you want to go, take some time off to think about it. Year one of medical school is a life-changing experience for anyone so be really sure you want to go before doing it. If you have been accepted and are sure you want to go, congratulations there is so much more you will learn about yourself along the way, and you are that much closer to being the doctor you’ve always wanted to be. Sometimes people find they don’t want to go AFTER they’ve already been there, and that’s ok too. The skills you will learn from a year of medical school will stay with you for the rest of your life and will surely make you a better person for it! Just consider all the options and learn as much as you can about it before diving into it. My name is Sally Feng. I graduated with a B.S. in Integrative Biology in May 2014. 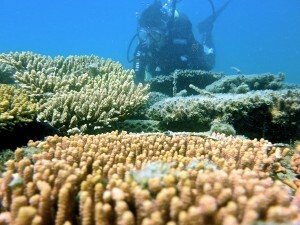 I am currently doing work on coral restoration in the Philippines under a Fulbright research grant. If you are interested in applying for a Fulbright, here is my experience. Before starting the application, you need to decide whether you are willing to commit to the process. You have to be determined, self-motivated and patient. This applies even more so once the scholarship has been awarded. It is not a study abroad program where you take a class with fellow students. You will spend up to a year on your own in a foreign country. Don’t let that scare you; it is well worth the opportunity and a very rewarding experience. Since it is quite a long journey, it is important to become familiar with the application process and deadlines. All U of I students will apply for the scholarship via the Top Scholars/National International Scholarships Program. The process involves submitting an online application, college transcripts, 1-page personal statement, 2-page grant purpose, 3 letters of recommendation and an affiliation letter. Keep in mind the letters of recommendation have different deadlines and specific submission instructions. To begin, determine a starting point. What interests you? Where do you want to go? This is your opportunity to be creative. If you need help, there are many resources available. Visit the Top Scholars office and read past submissions. Ask professors if they have contacts abroad that may be willing to accept you in their lab. Have others proofread your essays. I highly recommend submitting a draft for the priority deadline. Be very detailed in your essay to let the reviewers know you have done your research. Plan out the months of what you will be doing during your stay there. Talk about the preparations you will take to become a stronger candidate. Let them know you are interested in the culture and what you hope to gain out of it. Most importantly, convince them why they should fund you to go to this specific country. My starting point was the location. I wanted to work in water so I narrowed my search to islands. Next I looked into statistics. Based off of the 2013-2014 statistics for Philippines, of the 18 applicants, 8 were awarded. I began looking into universities that specialized in marine sciences. I looked into the research topics of faculty members to see if any were of interest. I found the topic of coral restoration very appealing so I emailed a professor telling him I was applying for a Fulbright and would love to work in his lab. He was willing to accommodate me at his lab considering that I would be fully funded throughout my stay. That may have sounded easy but couldn’t have been done without help. My initial draft needed a lot of work and I might have given up if it wasn’t for the support provided by my professors and from the Top Scholars office. I was told I had very strong letters of recommendation and my professors were rooting for me. That was encouraging to hear and I did not want to disappoint them. I continued to read research articles to get ideas. I emailed my prospective professor for advice on my grant purpose. I worked on new drafts until I was satisfied with my project. It is extremely important to come up with a project that you are interested in because this could potentially be the next year of your life. The application process is a rewarding experience by itself. Not only did I learn how to write a grant purpose, I was accepted into a lab at an international university. I have letters of recommendation ready for future references. I learned how to present myself on paper and in person. I gained confidence in the work I accomplished and the effort paid off. In the coming weeks, I hope to share more about my past and current research experience. If you have questions, feel free to contact me at feng.sally26@gmail.com. Best of luck!